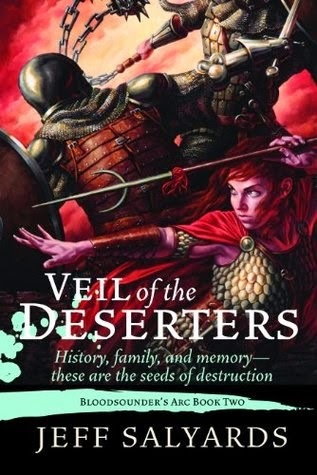 Veil of the Deserters is everything I was looking for in the highly anticipated follow-up to Scourge of the Betrayer. What Jeff Salyards has crafted here is a rare sequel that actually manages to outdo the first. The stakes here are bigger (and clearer), the world-building is taken to a whole new level, and the characters really come alive. Paced exceptionally well throughout, it also has the kind of killer climax that manages to completely satisfy, while still leaving the reader desperate for more. "My only complaint is that this feels like less of a complete story and more of a first arc in a longer book, the kind of opening installment that catches your interest but leaves you wanting to reserve judgement until you know more." Well, you can forget what I said about reserving judgement, and stop waiting to know more. Salyards gives us answers aplenty here, lifts the veil on the larger story, and pulls everything together in a novel that feels complete in every way. With the introduction of his sister, Soffjian, we not only learn more about who Captain Braylar is, but we begin to understand where he comes from, and what it means to be Syldoon. Their shared back-story is revealed throughout the novel, a few pieces at a time, and proves to be as complex as it is tragic. Soffjian is an interesting character in her own right, but it's in her role alongside Skeelana in exposing the reader to the secrets of Memoridon magic where she really excels. Arki really comes into his own here, stepping up as a man, a fighter, and as a force to be reckoned with in the army. He still has a tendency to stammer and draw out his explanations, but he also has learned to stand up for himself against Braylar and the rest of the Syldoon. He even begins to develop something of a tentative friendship with Vendurro, which adds a whole new angle to the story, particularly in revealing a more human side to the old soldier. Most importantly, though, we learn the Captain's true purpose in recruiting a scribe, and see him play a crucial role in the latter half of the book. There are some moments of morbid, gallows style humor to the tale that play well against the darkness of Captain Braylar's affliction, with his addiction to Bloodsounder getting worse by the page. It's that addiction which leads to a well-intentioned act of disobedience by Vendurro, Hewspear, and Mulldoos, and that simple decision to heal the Captain that proves to have significant repercussions in the story's final act. There's also some softer moments throughout the story, with friendships and the tease of a relationship rounding out what we already know of the Syldoon. It's with the revelations of Memoridon magic and overall world-building where Veil of the Deserters takes the biggest steps in escalating this second installment to a new level. We get to see more of the wider world, including Sunwrack - home to the Syldoon - and learn about the deeper politics involved not just between nations, but between Syldoon Towers. It's that world-building that brings about the biggest twists in the story, and which sets up a climax that delivers more than enough 'wow' to make up for the more subtle end to the first book. It's an entirely satisfying conclusion, one that pulls together all the key plot threads in the novel, and which provides a stunning cliffhanger - physically and emotionally - for the next book. Not that the first book needs to be redeemed or anything of the sort, but Veil of the Deserters puts that story arc into a larger context, and opens up the larger tale that Salyards has set out to tell. Definitely one of the strongest middle installments I've read in a very long time, and just an overall fantastic read. Highly recommended, especially to those who (like myself) came away from the first book wanting something more. I love rich world building! I was greatly anticipating your review for this! I didn't exactly come away from the first book wanting more, though I did feel it was a little on the short side but I really enjoyed the mystery. Still, looks like the meat the story will be in this second book, I can't wait!